Fun and Fitness has been running since 1992, starting out in Aldgate and then moving to the Bridgewater Community Club and now settled in the Bridgewater Institute. Classes have a mixture of movement to music, aerobic exercise, weights and balance and are suitable for all ages. Exercises focus initially on cardiovascular exercise, resistance work and later on balance and fitness. 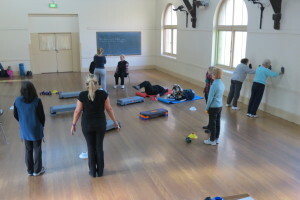 Classes are on Tuesday mornings from 9.00am to 10.00am, costing $6.